Stylish running horse silver charm bracelet. 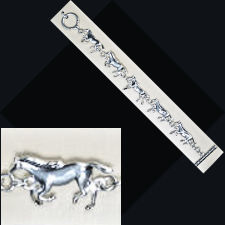 This 7" (17.8 cm) silver finish bracelet has 5 beautifully detailed running horses. Each horse measures 1" (2.5 cm) by 1/2" (1.3 cm). The bracelet closes with a toggle clasp.